Is this a diversion from our War on Terror, NASA is bleeding our resources from the War on Evil and S.D.I. Is this another Assault on our Freedom to spend on practical protection for our infastructure? Images released by NASA  not the whole story. "They did it! EeeHaa! The pictures are coming in." Just minutes before the photo shoot I was commanded to "Get those God Damned cows outta the way." 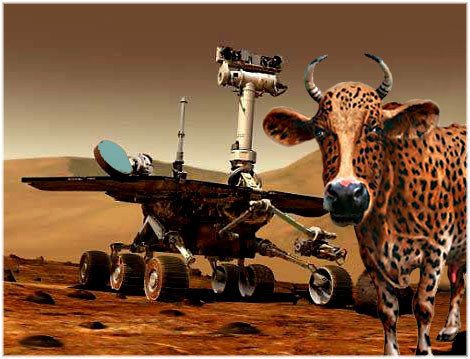 Mars Spirit Rover Landing is a Hoax. The real photos of Spirit Rover were taken in the Nevada Desert. The alleged Mars landing is a fraud. The Rover was unloaded and placed in the Martian-like-landscape eighty five miles south of Battle Mountain, Nevada. On a barren plane this photo was set up and shot by a crew working for Kellogg Brown and Root. Just minutes before the press release photos were to be taken for the Mars Spirit Rover, I took this snapshot of the rover in Central Nevada with a few of the permanent residence posing. The film crew and grips had to shoo scrawny cows out of the set-up. If one looks closely in the press released photos you can see cow pies littering the foreground. The Homeland Defense was present to control any contingency, our minder an agent Collins, told me, "this mission is Top Secret," however there were few contingencies for free range cattle that moseyed about the site. I, as a grip hired by the day for the shoot by the camera crew, was screened and approved for the task even though I was in arrears for child support. I had smuggled a small camera to the work site hoping to get a Gee Whiz Photo. Not being told of our job, left us uncertain as to what needed to be done but it soon became apparent when a herd of range cows came up the hill to see what was going on; they were looking for feed as the land would not support a cow for any length of time. The area selected was totally barren. My job was to shoo the cattle back over the hill out of sight. We scraped up the cow dung we thought might show in the photo, we also dusted out the cow prints, the shoot went off with little difficulty after the cattle were vanquished. We needed to wait for the sun to rise to the correct azimuth before the shoot could begin, so there was a lot of waiting around. I was paid and told to keep it quiet. It appeared to me the site was going to be used for subsequent photos as they had vans, motor homes and dune buggies, a water truck and several generators; there were at least seven Suburbans parked here and there, all were tucked behind a crater-like hill. They were going to be shooting many more setups but I worked for only one day. Now you know the publicity and brouhaha over our Martian Landing is a set-up much like the Apollo Mission on the Moon. I was told, The Apollo Mission was shot in an old Howard Hughs Hollywood Studio in Pasadena. And now I know it's true. looking for the holy grail to rationalize more Mars Missions. J.P.L. is looking into a possible fault tree failure. If the Spirit Rover can be drawn out from it's torpor there may be the opportunity to bring the Mars Mission back on line. Without data from the Mars Lander the Manned Mars Mission will be delt a blow, a possible set back of years. If it can be proved, as Jenny Randles suggests, the Martians have disabled the Spirit Rover while it was on the dark side of Mars, there may be more that NASA has bargained for. Had cameras been engaged and working through the chilly Martian nights (-120 below zero) there might have been confirmatin of this event. As it stands, it is claimed, a software problem has caused the SPIRITY ROVER to go mute. The Rover, Opportunity, has landed, now gracing the surface of mars with sophisticated sensing equipment to plumb the heavens for life and water. The second lander to touch down with pin point accuracy  All Systems are Go, for program related activities.